Probably not the same ones as the Tarahumara Native Americans. They are a small tribe living in Mexico. They live on mountainous, rocky land full canyons too difficult for most people to traverse. Since the land is so inhospitable, they've been left alone to practice their ancient traditions unchanged for many years. For entertainment, they run team-relay races that involve kicking a wooden ball. "Big deal" you say? Yeah, when a short race is 12 hours long. Some have gone on for up to 3 days straight, and all on tough terrain! This means their racers are running for at least 6 hours straight, over hills and canyons through the desert. Just like for you, winning for the Tarahumara racer is a big deal. They can't let anything slow them down on their way to the finish line. They don't carry backpacks full of energy bars, and they don't load themselves down with sport waters. There are no 'water stations' on their way through the remote corners of Mexico. But they have a blast anyway! What is their secret for fun that doesn't stop? Salvia Hispanica L. ! The exact same seed that is in X-Tra Life. 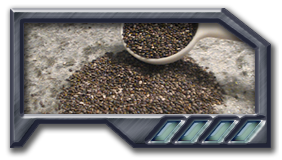 The unique gelling property of these mysterious seeds, enable them to soak up over 9 times their weight in water. This gel kept them feeling full, and released electrolytes to keeping them hydrated doing strenuous exercise. It also keeps the entire digestive tract hydrated, hanging onto liquid with its high levels of soluble fiber. The high protein content gave them the energy they needed to make the journey. It probably doesn't involve 6 hours of running through the desert. So just imagine what you could do, if you had the SAME EXACT energy food that the Tarahumara use? With X-Tra Life, it's right at your finger-tips in easy to use 1-serving packs. Why haven't I heard of this before, if it's so great? As you know, the Aztecs had an amazing civilization hundreds of years ago. They conquered great lands and had a formidable fighting force, as well as advanced knowledge of herbs and medicine. Salvia Hispanica L., once again! In the Aztec society, these seeds were so treasured, they were used as a form of currency. No one could deny it's power when you feed an army on only a little bit each day. It was even involved in their religious ceremonies. Due to all the benefits they got, they assumed it was a "Food of the Gods" sent to help them prosper and live in good health. Unfortunately this religious significance led the Conquistadors to outlaw the plant. It was lost to the majority of the world for centuries until today! Are you ready to use this treasure right now?